The parking area opposite Postbridge Visitor Centre is currently being used for logging operations and may be unavailable or only part available for the foreseeable future. Please continue not to use Postbridge Visitor Centre car park except for dropping off and picking up. Instead, use other parking areas at Bellever Bridge, along the Princetown road, on the road towards Mortonhampstead (but not outside the Warren House Inn), and on the Dartmeet road. Under the Information tab there is a new section designed for all Team Managers. 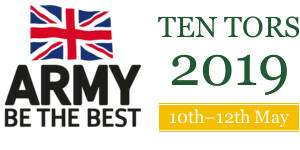 This guidance is written to assist Team Managers in training and preparing for Ten Tors. The new updated Annex A, which has vital information regarding Roads, Rivers & OOB areas can now be found within the Rules tab. On the majority of weekends leading up to the event, Dartmoor National Park is monitored by Environmental Compliance Monitors, who assist the Organiser’s in ensuring that training on Dartmoor is environmentally sustainable by including various measures in the Ten Tors rules. Establishments are training without completing the Team Managers Training on Dartmoor Log. RBNA’s have not been marked on some maps. The correct ID’s are not being shown on rucksacks or in minibuses. Not all groups are carrying Green Cards. Hi visibility clothing is not being worn whilst teams are using public roads. The restriction on parking in a carpark if it is already more than half-full of other Ten Tors-related vehicles, does not apply at either Willsworthy or Lane End carpark as both are owned by the MOD. A reminder to all Team Managers that the dashboard closes for payment at 2359hrs on the 31 January 19. Standon Farm and the surrounding area are Out Of Bounds whilst training for Ten Tors. The building is located in enclosed land and may be in use for military training at any time and without any warnings being displayed. Walking Groups may use the MOD permissive path between Standon Steps at SX 539816 South along the River Tavy to the Access Land at SX 541814.